Here’s a sweet-savory recipe for Curried Couscous that is made for your flat-belly diet. Flavorful curry and chicken broth balance the sweetness from raisins and apples, while red pepper and parsley add color to the whole-wheat couscous. You might think of couscous (KOO-skoos) as a grain, but it’s actually a form of pasta. 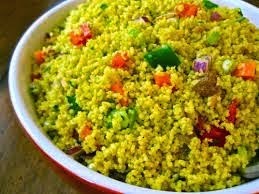 Couscous, which originated in North Africa, is made of semolina granules that are steamed or boiled.